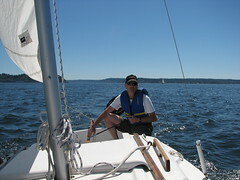 This afternoon Tim de Lacy joined me for a sail around Blake Island. The wind was good with just a couple of lolls. The scenery was great with clear skies and lots of sun. After the sail we took our wives out to dinner and a stroll through the Chris Craft boat rendezvous at the Port Orchard marina. A well appreciated summer day on the sound.